In April 2009, three months after his inauguration, President Barack Obama ordered the release of the last four torture memos that the Bush administration had used to justify harsh interrogation methods, including waterboarding, for terrorism suspects. The bizarre memos had been written by lawyers in the Justice Departments Office of Legal Counsel. Now Mr. Obama is refusing to release a memo written by his own Office of Legal Counsel, which claims the legality of an action far harsher than waterboarding: the targeted killing of U.S. citizens who are accused of working for terrorist organizations. The Obama administration has not even formally acknow-ledged that the memo exists, though its contents have been described in general terms to news organizations. Both the New York Times and the American Civil Liberties Union have filed separate lawsuits under the Freedom of Information Act seeking release of the memo and the specific rationale for the drone attack in Yemen last Sept. 30 that killed Anwar al-Awlaki who was born in New Mexico. Al-Awlaki held dual U.S.-Yemeni citizenship and had been identified as a leading al-Qaida recruiter and plotter. Also killed in the Hellfire missile attack was a Saudi-born U.S. citizen, Samir Kahn, an alleged al-Qaida propagandist, and two Yemeni men. But in 2010, after al-Alwaki had been tied to both the so-called underwear bomber and the Army major responsible for the Fort Hood, Texas, killings, Mr. Obama approved putting him on the Joint Special Operations Commands kill or capture list. He later was added to the CIAs kill list, too. Thus within two years, Mr. Obama had gone from rejecting President Bushs claim that he could detain U.S. citizens as enemy combatants to approving the summary execution of U.S. citizens deemed enemy combatants. What happened to change his mind so drastically, Mr. Obama has not explained.  Suspects should be captured when possible, but Congress has authorized the president to use all necessary and appropriate force against terrorists.  In a war with a stateless enemy, this nation can take action in another sovereign nation that is unable or unwilling to deal effectively with a threat to the United States. That is, we can militarily violate the sovereignty of another nation.  In a war, targeting specific senior operational leaders of the enemy is established practice: We killed Adm. Yamamoto during World War II and we killed Osama bin Laden  the latter case citing President Obamas own action as justification for the practice.  These are not assassinations, because assassinations are unlawful. Killing someone who presents an imminent threat of violent attack is not unlawful.  Even though the Fifth Amendment guarantees U.S. citizens due process, the president doesnt have to get permission from a judge for a targeted assassination because due process and judicial due process are not the same. This reasoning is misleading or dishonest. Merely to eavesdrop on a terrorism suspect takes a warrant from a Foreign Intelligence Surveillance Act court judge. They are available 24/7. The government presents its case for probable cause and, almost without exception, the court approves the warrant. But to kill someone, that doesnt take a warrant? Getting a court review of a case for the targeted killing of an American citizen would not be an undue burden on the presidents war-making powers. Death-by-drone is far too easy. It needs checks and balances. Furthermore, there should be robust debate among scholars, experts and average citizens on the legal rationale and case law behind the assertion that there are times and circumstances that the Constitution permits a president to be judge, jury and executioner. That claim should be tested in court and in Congress. Thats what the rule of law requires. We mourn the loss of judicial due process. We mourn the loss of rule of law. The president should give up the memo. This editorial has been edited from the St. Louis Post-Dispatch, March 18, 2012, and reprinted in PeaceMeal, March/April 2012. Coming less than nine months after he made United States history by becoming the countrys first African-American president, Mr. Obama said he was surprised and deeply humbled by the honor. I do not feel that I deserve to be in the company of so many transformative figures that have been honored by this prize, he said. I will accept this award as a call to action, a call for all nations to confront the challenges of the 21st century. He will travel to Oslo for the award ceremony on December 10 and will reportedly donate the prize money  roughly $1.4 million  to charity. Many observers were shocked by the unexpected choice so early in the Obama presidency, which has yet to yield concrete achievements in peacemaking. Some around the world and at home objected to the choice of Obama for being slow to bring troops home from Iraq and for escalating the number of troops in Afghanistan. Members of the Norwegian Nobel Committee said their choice could be seen as an early vote of confidence in Obama intended to build global support for his policies and lauded the change in global mood he has already wrought. In Europe and much of the world, Obama is lionized for bringing the United States closer to mainstream global thinking on issues like climate change and multilateralism. Obama is the third sitting U.S. president to win the award: President Theodore Roosevelt won in 1906 and President Woodrow Wilson was awarded the prize in 1919 for his role in founding the League of Nations, the failed precursor to the United Nations. When former Democratic President Jimmy Carter was awarded the 2002 prize more than 20 years after he left office, the Nobel committee chairman said that it should be seen as a kick in the leg to the Bush administrations hard line in the buildup to the Iraq war. Barack Obamas Inaugural Address was a stark repudiation of the era of George W. Bush and the ideological certainties that surrounded it, wrapped in his pledge to drive the United States into a new age by reclaiming the values of an older one. To read his words literally, Pres. Obama blamed no one other than the country itself, critiquing our collective failure to make hard choices and a willingness to suspend national ideals for expediences sake  a clear reference to decisions ranging from interrogation policies to wiretapping to the invasion of Iraq. Yet not since 1933, when Franklin D. Roosevelt called for a restoration of American ethics, has a new president so publicly rejected the essence of his predecessors path. When Pres. Obama looked forward, however, he was far less specific about how he would combine his lofty vision and his passion for pragmatism into urgently needed solutions. He spoke eloquently of the need to restore science to its rightful place and to harness the sun and the winds and the soil to fuel our cars and run our factories. But he never acknowledged that his agenda would eventually have to be reconciled with towering budget deficits or spelled out what unpleasant decisions he would be willing to make in the service of a renewed America. Every time Pres. Obama urged Americans to choose our better history, to reject a false choice between safety and American ideals and to recognize that American military power does not entitle us to do as we please, he was clearly signaling a commitment to remake Americas approach to the world and to embrace pragmatism, not just as a governing strategy but also as a basic value. It was, in many ways, exactly what one might have expected from a man who propelled himself to the highest office in the land by denouncing how an excess of ideological zeal had taken the nation on a disastrous detour. But what was surprising about the speech was how much he dwelled on the choices America faces, rather than the momentousness of his ascension to the presidency. Following the course he set during his campaign, Pres. Obama barely mentioned his race. He did not need to. The surroundings said it all as he stood on the steps of a Capitol built by the hands of slaves, and as he placed his own hand on the Bible last used by Abraham Lincoln. As his voice and image resonated down the Mall, he spoke across many generations, stretching to the Washington Monument and beyond. Mixed in the crowd were the last remnants of the World War II generation, led by the all-black Tuskegee Airmen for whom Jim Crow was such a daily presence that the arrival of this day seemed unimaginable. There were middle-aged veterans of the civil rights movement for whom this seemed the crowning achievement of a lifetime of struggles. And there were young Americans  and an overwhelming number of young African-Americans  with no memory of the civil rights movement or of the Cold War, for whom Pres. Obama was a symbol of an age of instant messaging, constant networking and integration in every new meaning of the word. By the time Chief Justice John G. Roberts Jr. administered the oath of office, Pres. Obamas ascendance was so historic that the address became larger than its own language, more imbued with meaning than anything he could say. He blamed Americas economic peril on an era of greed and irresponsibility on the part of some, and talked of how the ways we use energy strengthen our adversaries and threaten our planet. It was an explicit critique of an administration that went to war in the Middle East but rejected the shared sacrifice of conservation, and reluctantly embraced the scientific evidence around global warming. The new president left out specifics of how he would address a number of the hard questions facing him. He simply promised to strike the balance differently, as America tries to hew to its ideals while pursuing a strategy of silent strength. Whether he can execute that change is a test that has now begun. Mr. Sangers article  edited here  appeared in The New York Times on January 21, 2009. Can Obama take on the Pentagon? Under President George W. Bush, U.S. military spending increased by about 60 percent, not including spending on the wars in Iraq and Afghanistan. When Bush entered the Oval Office eight years ago, military spending totaled just over $300 billion. When President Barack Obama set foot in that same office, military spending stood at roughly $541 billion, including the Pentagons basic budget and nuclear warhead work in the Department of Energy. The Pentagon estimates that military operations in Iraq and Afghanistan will cost at least $170 billion in 2009, pushing total military spending for Obamas first year to about $711 billion  not including veterans care and other security costs. Thats almost six time more than the closest competitor, China , with a military budget of $120 billion. The United States alone now accounts for nearly half of all global military spending  48 percent, according to the International Institute for Strategic Studies. According to an October 2008 report by the Congressional Research Service, total war spending apart from the regular military budget is already at $922 billion and quickly closing in on the trillion dollar mark. With budgets everywhere bleeding red, some in Congress and elsewhere are finally raising questions about whether this level of spending makes any sense. Unfortunately, the questions are not coming from the presidents inner circle. Rep. Barney Frank (D-MA) drew the ire of hard-line Republicans and military hawks when, in October, he suggested that Congress should consider cutting defense spending by 25 percent. That would mean shaving $177 billion, leaving $534 billion for the U.S. defense and war budget and maintaining a distance of $413 billion to China. Frank said that, in the context of a struggling economy, the Pentagon will have to start choosing among its many weapons programs. Boeing CEO Jim McNerney wrote in a note to employees: No one really yet knows when or to what extent defense spending could be affected, but its unrealistic to think there wont be some measure of impact. But Marion Blakey, president of the Aerospace Industries Association, is pushing hard for a bottom-line guarantee via their Holy Grail  a military budget pegged to the gross domestic product. We advocate 4 percent of the GDP as a floor for defense spending. No question that has to be front and center for any new presidents agenda, Blakey says. While the cuts suggested by the Defense Business Board report got a lot of attention, the Pentagon has already laid the groundwork to lock the Obama administration into the over-the-top military spending of the Bush years. The Pentagons latest five-year budget projects $450 billion more in spending than their previous figures. In fiscal year 2010, for example, the Pentagon is calling for a budget of $584 billion, an increase of $57 billion over what they informed President Bush and Congress they would need just months ago. Unfortunately, when it comes to military spending and defense, the record is reasonably clear: President Obama is not about to go toe-to-toe with the military-industrial complex. The surge of troops that he wants to shift from Iraq to Afghanistan is unlikely to be a bargain. In addition, he has called for expanding the size of the Army and the Marines  in complete agreement with Defense Secretary Robert Gates. They say the Army should be increased by 65,000 new recruits and the Marines by 27,000. Most scenarios presented by defense analysts do not see a reduced base budget for the Pentagon, but rather predict decreases in supplemental funding for the wars in Iraq and Afghanistan. Sooner rather than later, however, the Obama administration will need to think seriously about how to spend smarter  and significantly less  on the military. Our nose-diving economy simply will no longer support ever-climbing defense budgets. Some of the choices that need to be made really arent so tough. Significant reductions can be made in spending on expensive weapon systems that are outdated or unproven. Some were designed for a geopolitical moment that is long gone  like the F-22, a $300-million-a-copy fighter meant to counter a Soviet plane that was never built. Others, like the ballistic missile defense program, are clearly meant only to perpetuate insecurity and provoke proliferation. To cut the military budget more deeply, however, means taking on something more fundamental and far-reaching: Americas place in the world. It means coming to grips with how we use our military to project influence and power anywhere in the world, with our attitudes toward international treaties and agreements, and with our economic and political relationships with clients and competitors. A new era in reduced military spending would have to begin with a recognition that enduring security is not attained by threat of force, nor is it bought with staggering billions of dollars. The Obama administration and Congress need to explore preventive models of security built by cooperation with other nations. Compiled from articles by Frida Berrigan, columnist for Foreign Policy in Focus, from TomDispatch.com, Nov. 25, 2008, and by Mark Engler, senior analyst with Foreign Policy in Focus, from In These Times, December 2008. Published in PeaceMeal, Jan/February 2009. An administration that leaves a legacy of having launched the second-longest  and still unfinished  war in United States history is about to expire. Another history maker, the first African-American elected to the highest office of our nation, is poised to assume the reins of power as the 44th President of the United States. In the coming months and years, the expectations of countless Americans, as well as those of President-elect Barack Obama himself, will meet the reality of doing business with a bipartisan Congress and a multitude of special-interest groups. Among them are those, such as ourselves, who advocate for peace and social justice within our borders as well as in our relationships with and actions toward our many neighbors around the globe. Im still having a hard time believing that the Democrats trounced the Republicans in this election. Im still huddled in a dark cave that formed around me over the past eight years of unnecessary wars, torture, secret prisons and detentions, the decay of our civil rights, and now a massive global economic melt-down. What a memorable time in history! What a great time to be alive ... on Mars, perhaps. But now, with Barack Obama headed to the White House and Republicans pushed further out of power in the House and Senate, I can almost see a new light shining in. Almost. Im still huddled in that cave, but the election results have driven a small pipe through the rubble that closes in the entrance, and a trickle of fresh air is slowly reviving me. Obama says he will close the prison at Guantanamo? Plan for universal health care? Withdraw our troops from Iraq? It all still seems like a misty daydream, but I think the majority of voters this year felt the same way and, so, elected a candidate who will work to build up our country, not drive us further into a moral and economic pit. Sad to say, thats not quite true in our community. While Washington State went for Obama by 58%, here in Benton and Franklin counties, Obama took only 36% of the votes  which might explain those feelings of loneliness and alienation, of being a stranger in a strange land. As I continue to work my way out of this cave, I salute the pendulum of our democracy. Although the pendulum can wreak havoc in its swing, it is comforting to know that it is now swinging the other way. Watching Obama during the campaign and now during the interregnum, I think I am coming to appreciate the virtue of not announcing some abstract doctrine but, rather, taking some concrete action that moves the reality to a different plane. So, rather than renouncing war, closing Guantanamo would be a good first step. I trust, with all that has been promised, that withdrawal of armed forces from Iraq will proceed with all deliberate speed and our role will be limited to helping repair the damage and alleviate the suffering war has caused. However, I fear the delusion that while Iraq is a bad war, Afghanistan is a good war. Our rationale for being in Afghanistan is as flawed as that for Iraq. However much I want to see peace in the Middle East, there are two wars going on here at home that I think must also stop. I refer to the War on Terror and the War on Drugs. Unfortunately, the rethinking about these wars has scarcely begun and is not part of our current discussion. The War on Drugs is in its 37th year, costing upwards of $50 billion a year, which adds up to more than twice the current $700 billion economic rescue package and all of which has been spent without any effect on rates of drug use in this country. Its impact on our foreign policy has been disastrous, from the Iran-Contra scandal to the current issue of trade treaties with Colombia. It has resulted in our seat of liberty having a prison system that dwarfs the gulags of Communist Russia. I hope that change means peace at home, too. President-elect Barack Obamas philosophy and vision for the future clearly present an opportunity for policies and actions that will influence peace. Fortunately, this opportunity applies both nationally and internationally. In contrast, the Bush policies and actions, such as starting wars, establishing Guantanamo, and creating wider separation between the rich and the poor, have had dire consequences. Instead of promoting peace, those policies have promoted division, unrest, and economic chaos. Obama believes in bringing people together, by reaching across the aisle at home and talking with both our adversaries and our friends abroad. He believes in being our brothers keeper, which means sharing the wealth, establishing programs to help the poor and middle class, improving availability of health care, and also addressing global warming and energy supply. These are all ideas that are not divisive, but promote peace in the minds of people. 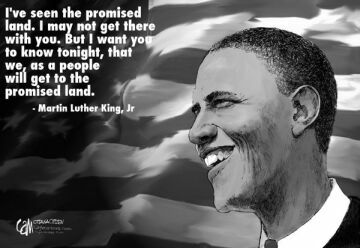 Therefore, we can look forward with optimism that Barack Obamas basic philosophy and vision for the future will greatly influence change to promote peace among people and nations.